Pot Stocks, ETFs, Top News And Data From The Cannabis Industry This Week – The Yield Growth Corp. This was a very active week in the cannabis capital markets, with Cronos Group reporting earnings, Canopy Growth applying to trade on the NYSE, Aurora Cannabis acquiring MedReleaf in the largest cannabis deal in history and GTI announcing intentions to go public in Canada. The news drove the United States Marijuana Index, which tracks 17 of the largest marijuana stocks in the U.S., up almost 5 percent. Meanwhile, the North American Marijuana Index, which also includes Canadian stocks, posted gains of less than 1 percent. The Horizons Marijuana Life Sciences Index ETF (OTC: HMLSF) gained 3 percent over the five days of the week, while the ETFMG Alternative Harvest ETF (NYSE: MJ) rose 1 percent. The SPDR S&P 500 ETF Trust (NYSE: SPY) slipped 0.55 percent. Jon Levine, CFO of MariMed Inc (OTC: MRMD) added, “We believe there are two important factors that are currently driving cannabis stock prices. The first is the bipartisan Congressional bill proposing to cement state rights to determine their own cannabis regulation. The second is this week’s Supreme Court allowance of state-authorized sports gambling, which is a states’ rights issue. Leading cannabis industry data, analytics and business intelligence firm New Frontier Data announced it has partnered with Benzingato bring its readers the latest information to our finance-savvy readers. Cronos Group posted first-quarter revenue of $2.9 million, up from $500,000 in the same period last year. Following the steps of Cronos Group, which recently started trading on the Nasdaq, Canadian grower Canopy Growth applied to list its stock in the NYSE. “We believe a Canopy Growth listing on the NYSE is significant for the Cannabis Industry not only because it would set a precedent and could serve as a catalyst for other ‘plant touching’ businesses to follow, but also (1) could provide added liquidity / currency for future acquisitions by Canopy Growth and (2) on the flip side, could make it easier for Constellation Brands (NYSE: STZ) to increase its stake in Canopy Growth (or facilitate a share purchase by any other comparable suitor),” GreenWave Advisors’ Founder and Managing Partner Matt Karnes told Benzinga. Aurora Cannabis announced it will acquire MedReleaf for C$3.2 billion ($2.51 billion). This marks the largest deal in cannabis history, and will create the biggest company among legal operators. “This is the second large acquisition of the year for us after acquiring CanniMed,” Aurora Cannabis’ Chief Corporate Officer, Cam Battley told Benzinga. “This deal is about complementary assets. It’s about having similar and aligned philosophies and strategic visions. That is the case with MedReleaf. They are an ideal acquisitions for us and they add to our capabilities enormously. Green Thumb Industries (GTI) entered into a Letter of Intent with a Canadian company for a reverse takeover (RTO) that will result in GTI becoming a publicly traded company on the Canadian Securities Exchange. The deal is expected to close next month. With a vertically integrated supply chain, GTI manufactures and sells a well-rounded suite of branded cannabis products and owns and operates seven manufacturing facilities and a chain of retail locations in six highly regulated, limited supply U.S. markets. Licensed cannabis production facilities owner and operator iAnthus Capital Holdings Inc (OTC: ITHUF) announced a $50 million investment from Gotham Green Partners. Management believes this is the largest investment to date by a single investor in a publicly traded U.S. cannabis operating company. iAnthus plans to allocate the proceeds of this financing to repay a $20 million one-year note and accrued interest to VCP Bridge LLC; continue to build out cultivation facilities and dispensaries in the New York and Florida markets; and, potentially, to expand activities. The remaining expenditures for completing iAnthus’ Massachusetts and Vermont operations will be funded with current cash on hand, management assured. Viridian Capital Advisors (through its broker dealer Pickwick Capital Partners, LLC, a member of FINRA/SIPC), closed on a $6.5 million financing for Gloucester Street Capital, an owner of one of only 10 medical cannabis cultivation and dispensary licenses in New York State. With the third largest population in the U.S., the New York State market for medical cannabis is expected to be among the largest in the country. Gloucester Street Capital’s seeks to bring its proprietary manufacturing processes, compassionate patient care delivery systems and go-to-market strategies to the production and delivery of pharmaceutical-grade medical cannabis. Montel Williams’ Lenitiv Scientific debuted it’s new line of hemp-derived CBD products and announced a deal with Cura Cannabis Solutionsto produce both Lenitiv’s hemp-derived CBD line as well as its cannabis-derived line. Lenitiv will also launch its next-gen line of cannabis oils this summer. Cannabis-focused debit payments solutions company CanPay started offering e-commerce payments processing. In addition to expanding payments online, CanPay has doubled the number of states it operates in nationwide to 14, including New York, Pennsylvania, Massachusetts, New Hampshire, Michigan and New Mexico, serves tens of thousands of users across 120 retail dispensaries, and integrates with leading POS systems OMMPOS and LeafLogix. 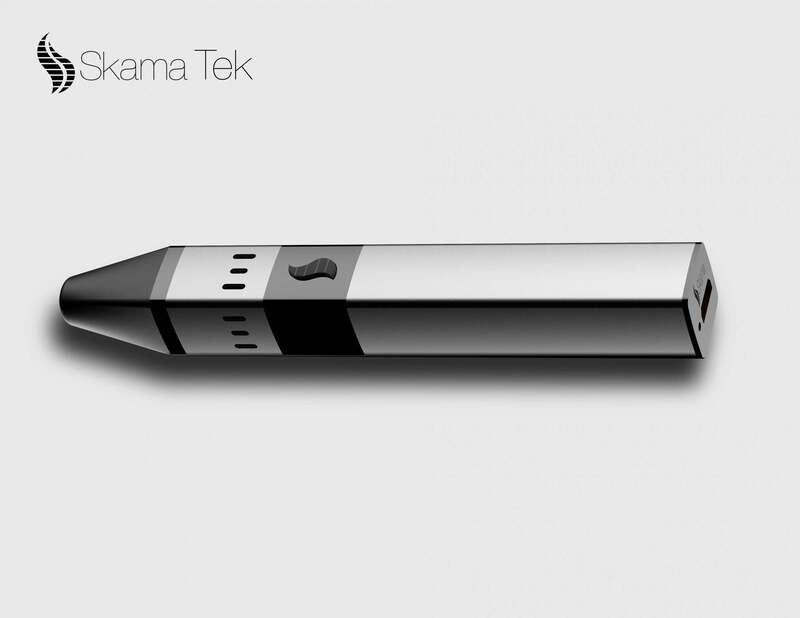 Former Marine Bryant Burton announced the debut of Skama Tek, a portable dabs vaporizers maker that donates a device to a veteran for every one that is sold. Studio City cannabis retailer Wellness Earth Energy Dispensary (WEED) announced a collaboration with renowned pop artist and LGBTQ+ advocate, Nina Palomba. Palomba will install a collection of artwork, “Love and Light,” at the dispensary, remaining on show from June 4 to July 15. Just days before the royal wedding, Leafbuyer.com unveiled ‘Markle Sparkle,’ a new cannabis strain developed by the nephew of soon-to-be-royal Meghan Markle, Tyler Dooley. The product, in flower and concentrate form, will be officially unveiled on June 2 at the High Times Cannabis Cup in Northern California. This sativa-dominant hybrid that helps relieve pain, anxiety and insomnia. “We’re thrilled Mr. Dooley chose Leafbuyer to help launch his new ‘royal’ strain,” said Kurt Rossner, CEO of Leafbuyer Technologies Inc(OTC: LBUY). FLRish Inc., the management company behind Harborside retail dispensaries and brands, and a cultivation facility in California, announced a $5 million qualified equity financing. Proceeds will be used to fund the expansion of FLRish’s retail management platform to additional client dispensaries, continue the build-out of its cultivation facility, and for general working capital and corporate development purposes. Cannabis-focused payment solutions platform Alt Thirty Six announced a partnership with software technology provider WebJoint. The companies will work closely together to strategically identify ways to deploy systems out to the cannabis market, with an ultimate goal to take it fully cashless. WebJoint will implement its software with Alt Thirty Six’s application programming interface, allowing the two programs to seamlessly communicate with each other. As a result, WebJoint’s clients will have the option to accept digital payments through Alt Thirty Six’s platform, which uses Dash digital currency as an alternative to cash. The company’s blockchain technology allows for payment transactions to process instantaneously, eliminating the risk typically associated with cryptocurrency transactions and market volatility. Yield Growth announced the debut of Juve Wellness, a subsidiary focused on the research and development of a modern wellness brand infused with Ayurvedic insights. “We anticipate that we will be the first topical brand focused on the intersection of Ayurvedic principles and legal cannabis to go to market. Licensees will have the option to infuse the Juve Wellness products with cannabis or distribute them without,” said Penny Green, CEO of The Yield Growth Corp.
Boulder-based Green Dot Labs released its first-ever vape cartridge, the Black Label Full Spectrum Extract (FSE) Cart. The Black Label FSE Cart borrows from the world of live resin concentrates to deliver a distinctive, easy to use concentrate experience. While most pens on the market today are marketed using generalized terms like Sativa and Hybrid or supposed effect, Green Dot Labs is releasing dozens of varietal-specific cartridges featuring rare and proprietary cultivars from the company’s genetic library. “We have always operated under the belief that hydrocarbon extracts are the purest, most authentic representation of the cannabis plant’s vivid sensory profile and myriad wellness benefits, and we wanted our varietal-specific pens to reflect that,” CEO Alana Malone told Benzinga. The industry witnessed the debut of The High Finance Fund, a women run, $20 million equity fund focused on the industrial hemp and cannabis industry. Managed by Wendy Robbins and Karen Paull, the producers of the popular series “The Marijuana Show,” which runs on Amazon Prime, the fund is interested in investing in industrial hemp cultivation, processing, system roadblocks and solutions, and international CBD wholesale and retail deals. It will also fund non-plant touching cannabis and real estate deals. The opportunities the fund choose are based on data, trends, commercial viability, intellectual property, assets, ability to scale globally, solid management teams with proven track records, leading scientific methods, and brands with broad consumer appeal. 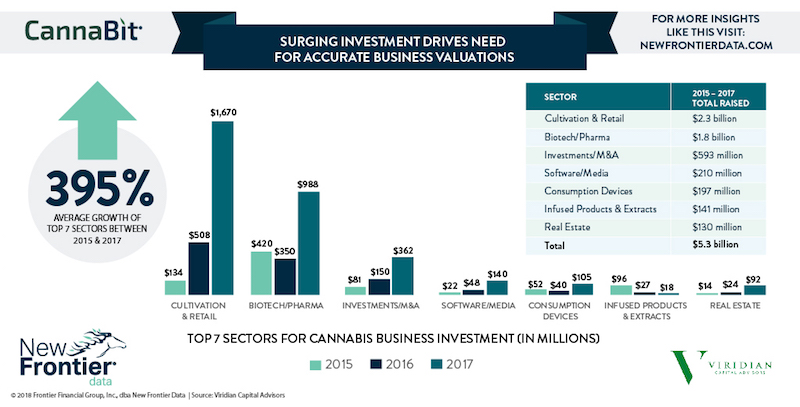 New Frontier Data and Viridian Capital Advisors revealed which sub-sectors in the cannabis industry are witnessing the largest investments in 2018 and how these investments are impacting valuations. “Surging investment activity among each of those sectors heightens the premium for accurate business valuations,” New Frontier Data explains. Cannabis journalists seeking to connect with expert sources and businesses can now use AxisWire’s STAR (Submit to a Reporter) Source Locator service. This service is free for journalist and available to publicists and brands for a small monthly subscription fee. May 18: WebJoint is hosting the California Cannabis Awards in Los Angeles. The CAAs is a high-end event geared towards nominating and awarding the top companies, entrepreneurs and advocates in the cannabis industry. Check out details and nominees following this link. May 18: Organizers for one of the largest cannabis culture events in the world, The Emerald Cup, announced tickets for this year’s gathering, taking place December 15 and December 16 in Santa Rosa, California, will be available starting Friday. The Cup will feature acclaimed musical acts, presentations from experts, artists, and educators across the industry, product and flower judging across multiple categories, and incredible food, vendors, products, and entertainment. May 19 – May 20: The 7th CannaGrow Expo will take place in Palm Springs, California, featuring more than 35 cultivation-focused educational sessions and an expo hall filled with cannabis-related technologies. In addition, the event will include a special Extraction Summit. Pass prices range from $99 – $399. For more info visit their website. May 22: Industry Power Women and IC3 are hosting a brunch to close the The 2nd Institutional Capital & Cannabis Conference (West) at the J.W. Marriott Los Angeles. Interested parties and sponsors can email the organizers to get more information clicking here. May 30 – May 31: Former Mexican President Vicente Fox announced his own cannabis event, CannaMexico. This world summit will take place in Guanajuato, Mexico. Speakers include Mr. Fox, activist Cheryl Shuman and many others. See details here. August 17 – August 18: Benzinga is hosting its first Cannabis Capital Conference in Toronto, Canada. Speakers include 420 Investor Alan Brochstein, MedMen’s CEO Brett Roper and Lewis Goldberg of KCSA. Read all about it here.